Ed. note: What part of “illegal” don’t these people understand? And yes, we’re talking about the federal government. 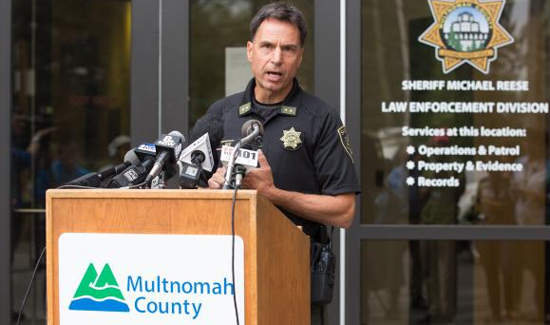 PORTLAND, Ore. – Following U.S. Attorney General Jeff Sessions’ Portland speech decrying sanctuary cities, Multnomah County Sheriff Mike Reese tweeted his support of the county and city’s policies regarding illegal immigrants. “Our community is safer when all people feel confident about going to local law enforcement when they need help,” Reese said in the first of a nine-tweet response. 1/- Our community is safer when all people feel confident about going to local law enforcement when they need help. In December, commissioners voted to designate Multnomah County a sanctuary county. Portland has also declared itself a sanctuary city. During his Tuesday speech, Sessions argued that in order to reduce violent crime in America, cities like Portland must drop sanctuary policies. 2/- We need all Mult Co residents, no matter their immigration status, to feel confident going to law enforcement w/o worry of deportation. “Such policies undermine the moral authority of law and undermine the safety of the jurisdictions that adopt them,” he said. 3/- Law enforcement begins with understanding that all people have a right to be treated with respect and equal protection. “Local law enforcement should be focused on building trust within the community, not doing the job of federal immigration enforcement,” Reese said. Later in his series of tweets, Reese said he agreed with last week’s federal judge’s ruling that blocked the Trump administration’s effort to withhold federal funds for public safety from sanctuary cities. “Once trust is lost, it cannot be easily repaired,” he said. Furthermore, Reese argued if the Trump administration “wants to make controversial and dangerous changes to immigration enforcement” they should work with Congress as opposed to local law enforcement agencies. “Forcing local law enforcement to act like immigration agents makes all of us less safe,” Reese said. 9/9 Forcing local law enforcement to act like immigration agents makes all of us less safe. “There are legal ways for federal, state, and local law enforcement to cooperate to help keep our communities safe and I support those efforts,” Reese said in a statement after the meeting.